Flowers of Evil was an entirely serendipitous impulse check-out from my local library. 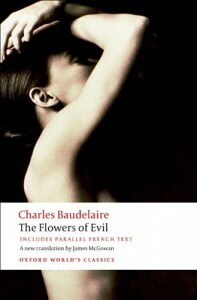 I can only imagine that what caught my eye was the title - Flowers of Evil - who could resist? So I pulled it from the shelf, opened it up at random, read a few verses, and said to myself "This isn't bad." Not only was it "not bad" but it was extraordinarily good; good enough that Baudelaire has joined the list of authors I'll pay money for. Of which regards him as a kindred thing. So perfumes, colours, sounds may correspond. Singing the senses' rapture and the soul's. You are a pink and lovely autumn sky! On my sad lip, the smart of memory. Pillaged by a woman's savage tooth and nail. My heart is lost; the beasts have eaten it. They drink, they pull each other's hair, they kill! O Beauty, scourge of souls, you want it still! Burn up these meagre scraps spared by the beasts! And, unlike in re my Russian literary interests, I was pleased to find that my graduate-school French was good enough that I could intelligently compare the parallel texts in the Oxford edition. McGowan uses a variety of techniques in translating Baudelaire; sometimes following both syntax and wording nearly exactly, sometimes translating a bit freely. In most cases I think he comes very close to capturing the original's intent. There was something that I found utterly inexplicable: There is a missing poem. The final section of the Oxford edition are 14 poems (supposedly) that were included in the 1868 edition of the original work. Poem #3, "The Peace Pipe," isn't there. The text goes from poem #2, "To Theodore de Banville," to poem #4, "Prayer of a Pagan," as does the table of contents. I probably would have missed it entirely because I usually don't focus on the numbering but for the fact that there's a note for "The Peace Pipe" on page 383. Despite that, readers of this review are safe in assuming that I highly recommend Baudelaire.